Botrychium dissectum.D. Busemeyer.SEINet.swbiodiversity.org (Accessed 8/2015). 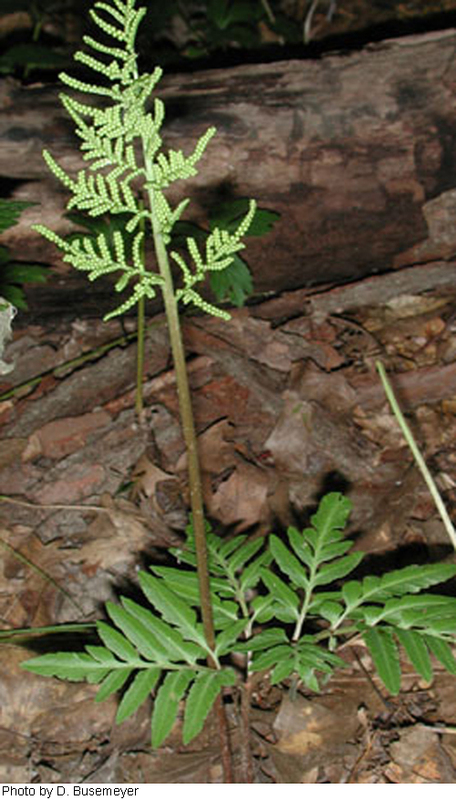 Botrychium dissectum is a fern 10-30 cm tall, from fleshy, mycorrhizal roots, it appears to be colonial (personal observation). Leaf solitary, arising from lower part of fertile stem, roughly triangular in outline, on a stalk 3-7 cm long, blade divided three to four times, often reddish when expanding, and bronze in autumn, divisions usually unequal, irregular, tips of major divisions less divided; fertile spike (sporophyll) to 10 cm long, fertile frond branched and much divided. Habitat: Open areas or woods on sterile soil. Notes: Gametophyte non-photosynthetic, closely associated with specific fungi below ground similar to Lycopodium sp. (S. Clemants, personal communication; Montgomery and Fairbrothers 1992). It has been shown that, for some species of Botrychium, exotic earthworms may inhibit establishment of new individuals (Gundale 2002). 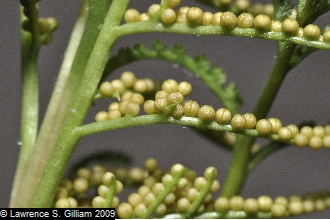 This includes the Botrychium/Sceptridium dissectum var. obliquum found by Zihao Wang in Manhattan.